Originally written for Outdoors Magic, altered slightly for the blog. There was a distinct ruffling of leaves coming from somewhere over my right-hand shoulder and seconds later my waterproof coat that was hung outside my tent drying fell mysteriously to the ground. Minutes earlier, I had heard the creaky opening and closing of a gate on the path just 50ft from where I had decided to pitch my tent. My heart hammered out of my chest as I considered all the options for who could be stalking my tent. At that moment, a bright glow from outside lit up the green canvas and, thinking it was a torch, I sat stark upright attempting to control my breathing. Then I slowly unzipped the door and nervously peered into the direction of the light. There, I saw a full moon suspended in the sky, just peeping between two pines and beaming into the forest clearing where I was camped. It was not what I had expected to see; the sight was breathtakingly beautiful. It was my first ever solo wild-camp and I was understandably a little on edge. I had walked 12 miles since 2pm that day until I could barely walk anymore due to fading light and energy, flinging my big backpack down at the first moment possible and not giving much thought as to whether or not the area was suitable. Though I failed astoundingly to sleep a wink all night, my first night on the West Highland Way showed me the true wildness of Scotland and I was already infatuated by it. Why walk the West Highland Way? I don’t remember what made me decide to want to walk the West Highland Way (WHW), all I can tell you is that it became a fixation. 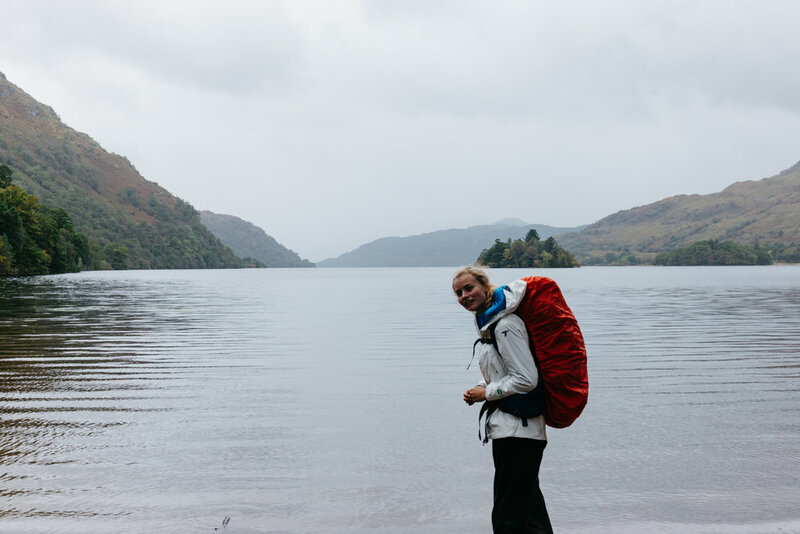 Perhaps it all began after reading and watching ‘WILD’ and making an oath to myself to complete the Pacific Crest Trail one day; this 96 mile long-distance hike in the Scottish Highlands - from Milngavie to Fort William - seemed like a good way to start. Or maybe it was because the mundaneness of city-life had me restless, and after previously spending four months cycling around New Zealand, a month on the road in the Pacific Northwest and three weeks backpacking around Italy, packing up once again and hitting the trail actually felt like the most natural thing in the world. Yet though I was quite accustomed to 20 mile hill-walks and cycle-touring trips in foreign countries, there was something that made me anxious about a multi-day hike; wild-camping alone and long days in the hills with no one to complain to about the weight of my backpack. Perhaps that fear is another reason why I decided to do it. And indeed, it turns out that walking every day with a heavy rucksack on my back and nothing much to think about but how beautiful the hills looked in their glorious Autumn glow was my idea of heaven. The WHW was my first long-distance hike and it undoubtedly sparked a fire in my legs and my heart to spend more time on the trails, and maybe one day to just keep walking. Accessible: One of the main things that drew me to hiking the West Highland Way was how accessible it was. You don’t need any specialist gear; just camping and hiking gear. You can get to the start in Milngavie via public transport, with a train to Glasgow and a local bus to Milngavie. Then from Fort William, take either the train or a bus back to Glasgow. And it doesn’t take long to complete the walk. I did it in 5 and a half days, but I’d recommend allowing yourself a week - there’s plenty to do around Fort William if you arrive early. Safe: Being my first solo hike and camp, I wanted to do something that would make me feel safe and comfortable. On the West Highland Way, you’re never far from civilisation if anything goes wrong, and you can even stay in hostels, hotels or B&Bs if the weather is atrocious. Almost everyday, you pass by a town or at least one pub, and you see plenty of other people along the Way - especially if hiking in peak season, throughout the summer. Cheap: The nature of doing a long-distance walking challenge is that it’s super cheap to do, especially if you already have all of the gear you need. Your main costs will be transport getting to the start of the walk, food enroute, and any accommodation if you decide not to camp for a night. Landscapes: I had my first taste of Scotland the summer before I hiked the WHW and fell head-over-heels in love. I wanted to go back and see more of the wild lands, to appreciate Scotland’s wild-camping laws, and feel immersed and at one with nature. Accommodation: Wild camp on the route, or stay in one of the many hostels, hotels and B&Bs along the way. Getting there: Take a local train from Glasgow to reach Milngavie. Return on the bus from Fort William back to Glasgow. Scotland’s first long-distance footpath, established in 1980, the WHW runs from lowland to highland: from the urban outskirts of Glasgow to the picturesque shores of Loch Lomond; from the wilderness of Rannoch Moor to the familiar romance of Glencoe. Despite its range of terrains, geology, flora and fauna, you don’t need any specialist kit for the hike - a good pair of walking boots, warm sleeping bag and relatively lightweight tent are the essentials. In fact, though I carried both a map and compass for the ‘just-in-case’, I barely used either (only really using the map for mileage). You will soon become accustomed to looking for a small hexagonal symbol with a thistle inside that highlights the trail, much of which follows historic routes on old Highlander footpaths, farm roads and railway lines. The WHW is the perfect inauguration to long-distance hiking; passing cafes, pubs and villages, and offering the option of staying inside in either a B&B, hotel, hostel or bothy every night. It’s even possible to have your bags transferred, so the only thing you have to carry is a day-pack. This is a great option for those who don’t have time to train with the weight of the backpack. I, on the other hand, yearned the wildness of the trail; I was carrying around 16kg of gear, I had planned to wild-camp every night and I was hoping to finish the 96 mile hike in six days. Getting to the trailhead involves a train to Glasgow, and then a local train to a little village called Milngavie (pronounced “Mull-guy” I later discovered). In the centre of this small suburban town, there is a plaque commemorating the start of the trail. It was a regular Monday at the beginning of October when I arrived here with my big backpack and camera slung over my shoulder. A local friendly man with a strong Scottish accent offered to take my photo, and despite the nervous look on my face, in my heart I was raring to go. My first day on the trail was an easy one, following foot-paths, tracks, an old railway line and passing a famous whiskey distillery. Despite only setting off at 2pm from Milngavie, I was surprised to manage 12 miles on the mostly flat terrain. I filled up my water bladder in Drymen but decided to camp a little outside the village in an area of woodland I spied on the map. It turns out a lot of other people chose to camp here too, as I walked past tents the next morning before dropping down to Loch Lomond. The views on day one aren’t the most breathtaking, but they prepare your legs and back for the days ahead, and your mind for the beauty that will ensue. After that first sleepless night on the trail, my legs and spirits were awoken the next morning with a hike over Conic Hill. At 200m, Conic Hill gets its distinct shape from the Highland Boundary Fault which follows the alignment of the islands that are scattered through Loch Lomond. First visible from the top of the hill, the loch will be followed for the next 2-3 days so you will soon become accustomed to its 23-mile length with inspiring views of the Arrochar Alps beyond. Once you drop into Balmaha beside the loch, stop for coffee and cake at the lovely St Mocha coffee shop before continuing up the loch. Despite my heavy eyes, that day I hiked around 19 miles to Rowchoish Bothy - a mountain hut nestled amidst woodland on the banks of the loch. Where once there were nine families, there is now just one cottage converted as a memorial to William Ferris, founder of the Rucksack Club (which evolved into the SYHA), the Scottish Ramblers Federation and director and chairman of the Rights of Way Society - certainly worthy of a much-loved bothy. With room for over 10 people, I would definitely recommend staying at Rowchoish for a chance to meet other hikers on the WHW; sharing stories around the log-burning stove over hot chocolate and whiskey. I met some lovely people here who I ended up hiking with over the following days. My trail friends! Walking up the northern edge of the loch from the bothy, the terrain is fairly difficult and slow as you clamber over boulders and around trees. The landscape becomes noticeably more rugged and wild as you leave the loch behind and enter Glen Falloch; suddenly you are all-consumed by those distant hills you could see from atop Conic Hill just a couple of days before; rolling moorland scattered with Highland cattle, wide glens and pine-covered peaks. That afternoon was wet and miserable, so I took a detour with a trail friend to the Drover’s Arms for a hot lunch, then decided to stay at the Crianlarich Hostel to dry my clothes and shower before the next 3 days. That afternoon was undoubtedly my favourite on the trail. The rainclouds parted and the sky became a hazy shade of blue as I walked towards the distinct 1000m bulk of Beinn Dorain, with its near-perfect bald peak and craggy banks. I was finally able to stuff my down jacket into my rucksack; wearing just a thermal and t-shirt as the sun beat down on my beaming face and my feet stomped on the wild Scottish ground beneath the watchful eyes of mighty Beinn Odhar, Beinn a’Chaisteil and Beinn Dorain. I descended towards lovely Loch Tulla with its Autumn-coloured banks, pitching my tent in a wildly beautiful campsite; a small clearing not far from the Inveroran Hotel, the base for some of the first meets of the Scottish Mountaineering Club in the 1890s. Settling for the night beside a still pond reflecting the surrounding yellow moorland and distant hills, I was delighted to spot some stags grazing on the other side of the water, and as the sun went down I ate my 3-minute pasta in complete contentment. Yet the peaceful night’s sleep that I really needed turned into a sleepless and mildly terrifying experience as a rutting stag decided to stalk my tent all night… If you’ve ever heard the intensity of the noise that these stags make at this time of year, you’ll understand when I say that it was an experience I certainly won’t forget. From Loch Tulla, the Way skirts the western edge of Rannoch Moor; a vast area of lochans, rivers, flora and fauna - often considered one of the last remaining wildernesses of Europe, and perhaps the bleakest moor in Scotland. Then onwards you amble towards Glencoe; passing the looming pyramid of Buachaille Etive Moor and ascending the zig-zag path of Devil’s Staircase to 550m, the highest point on the WHW. From here, there are panoramic views of the rising moorland around Kingshouse (namely Meall a’Bhuiridh, Sron na Creise and the Three Sisters of Glencoe) and the remarkable pass between the two Buachailles (Mor and Beag). The descent down to Kinlochleven is long and arduous. I camped in the village at a small campground; enjoyed a trip to the pub, a co-op (hello chocolate) and a shower once again. This was actually the hardest day on the trail for me, as having slept barely a wink the night before, I felt exhausted and emotionally drained - my mind going over and over some of the things I had been trying to escape by walking 100 miles in Scotland. I cried and walked for most of that day, feeling frustrated and hopeless. But, my tears were the great purge of emotions that I needed. This was why I was walking. The final day on the WHW is a short 13 miles from Kinlochleven to Fort William, the end of which offers excellent views of Ben Nevis - climbed by many WHW walkers once Fort William is reached. By this point I had become somewhat addicted to the Scottish wilds - to getting lost in my thoughts as my boots pounded on the soil; to the weight of my backpack and having no phone service or time restraints. I think the weather had aligned with my mood that day, as rain became sun became cloud became rainbows and I fluctuated between a desire to walk as fast as possible to reach the finish line but a great sadness for it to end. When it did, I joined two German friends for a few pints and curly fries in Grog & Gruel, before an early night in a dingy hotel room in Fort William. It didn’t tale long before I was yearning for the wild again. I suppose there is a great contradiction of doing a shorter long-distance walk like the West Highland Way; though it is the perfect escape from life for a while, it instills the greatest desire to just keep going. Perhaps one day I will, I thought, as I crossed the finish line after 96 miles. Indeed, for me at least, the West Highland Way opened a Pandora’s box of multi-day hiking across the world. It made me feel strong, independent and free, and I re-entered my normal, everyday life with a new burst of energy, inspiration and life. I would highly recommend hiking the West Highland Way if you’re craving a wild adventure not far from home. Let me know in the comments if you have anymore questions about the hike!